Flying a drone can be a lot of fun, but pick a drone that's too advanced and flying it could wind up being a major drag. The TobyRich Moskito was designed for first-time pilots who want a drone they can fly immediately after unboxing. Although it normally costs $60, it's on sale for $44.99. 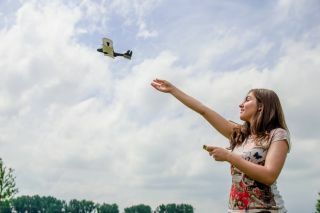 After downloading the free Moskito app, first-time pilots can attach the included joystick to their smartphone's screen for a natural, gamepad-like way to control the propeller-based plane. Alternatively, it can be controlled without the joystick and by simply tilting your handheld. The Moskito features a crash resistant design, so it can withstand impact and minimize any damage to objects around you. The drone charges in 20 minutes and offers up to 12 minutes of flight time. It comes with a spare propeller should the included one get damaged.